Step 1: Prepare the pancakes. Place the flour, the baking powder, the salt, the sugar, the cloves and the oats in a bowl. Put the yoghurt, the eggs and the currants in another bowl and mix well until the mixture turns into a smooth custard. Pour the egg-yoghurt mixture into the bowl with the flour and start mixing, while gradually adding water, until you get the desired result, which is a firm batter. Step 2: Heat the oil in a frying pan and add spoonfuls of the batter into it. Fry the pancakes for 3-4 minutes on each side. Remove the pancakes and place them on paper napkins to drain. Step 3: Prepare the quince jam. Place the jam in a small saucepan and add 2-3 tbsp of water. Heat the jam for 5 minutes until it becomes runny. 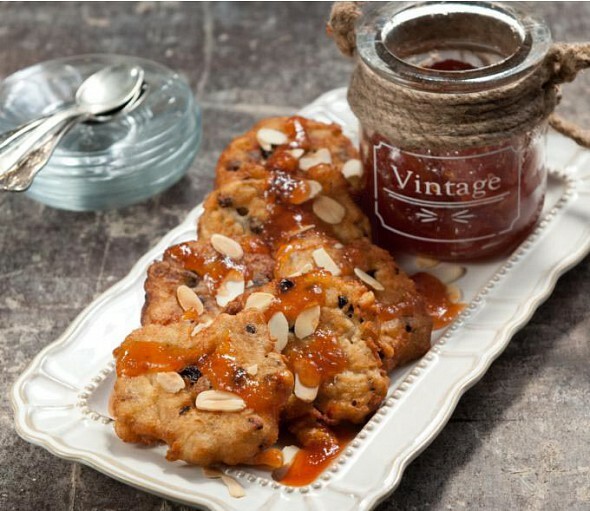 Step 4: Arrange the pancakes on a platter, drizzle with the thinned out jam, sprinkle with the almonds, and serve. A healthy, hearty breakfast. A crisp pancake crisp with a special flavour.